The F-2 gets its performance prowess by employing dual 6.5-inch IMG woofers and a 1-inch aluminum-dome compression driver coupled to an exclusive square Tractrix® Horn. It also features a custom sculpted port that is located on the front baffle near the floor for intense low-frequency extension. The F-2 offers bi-wire capabilities allowing the use of one or two speaker level inputs as desired for improved connectivity. Available in a black finish with titanium accents the contemporary look of the F-2 is two-fold. With its grille on the F-2 offers a sense of elegance that nicely blends in with your home décor but take the grille off and you get an aggressive and powerful statement that exudes extreme performance. This floorstander's expert combination of smart new designs and tried and true Klipsch technology provides incredible life-like music and film sound reproduction. 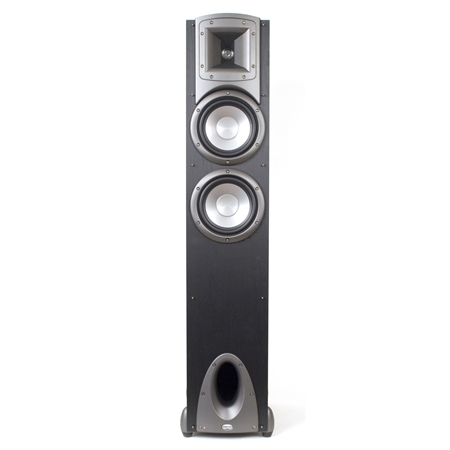 And its wide deep soundstage and exceptional imaging are typical of all Synergy Series models.